Hey, y'all! 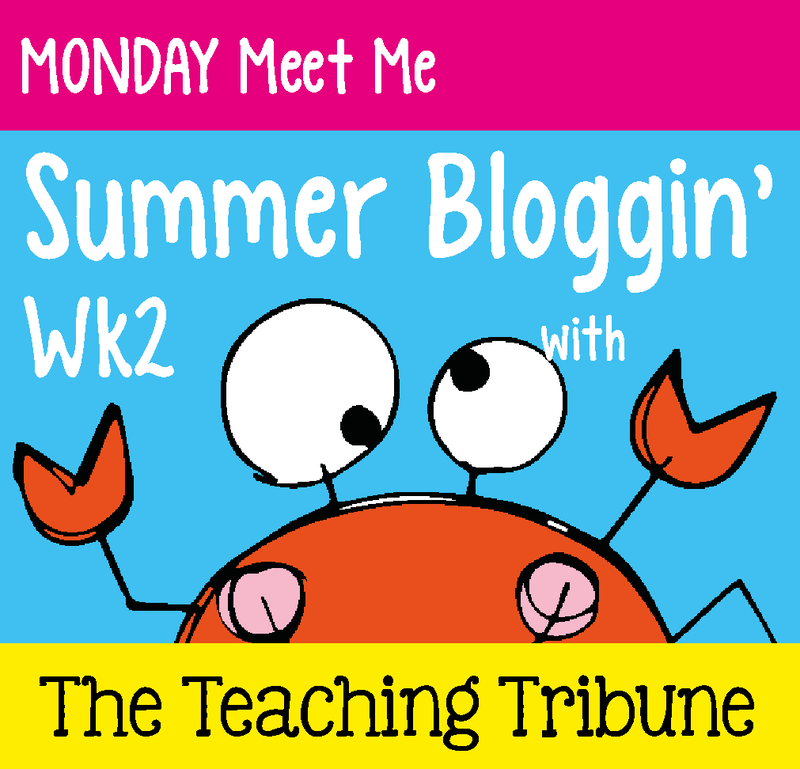 I'm here linking up with The Teaching Tribune for their Summer Bloggin' Monday Meet Me party, hoping to meet some new bloggy buddies while I'm on my first official day of summer vacay! 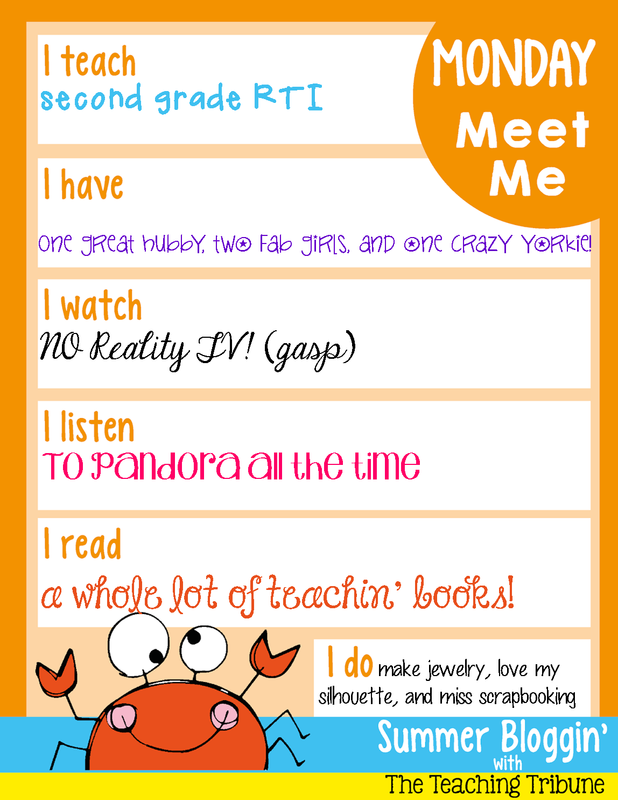 I teach...second grade in South Carolina. My class is so special! It's kind of like a transition between first and third grades, with just 12 babies! We concentrate all our efforts on reading and math intervention. This was my first year teaching RTI, and I was thrilled with the results - I had one baby move from a level 8 to 30 in reading! I have...a wonderful family and feel so blessed! Brady and I have two beautiful daughters - one going into 7th grade and one going into 4th. Where does the time go? Thankfully, LuLu the yorkie stays puppy-sized! I watch...a lot of HGTV and have never even seen one episode of reality TV! I know. I listen...to Pandora Radio all day. I love music - all kinds - and I love being able to choose my own genre, songs, artists, and have NO commercials! My favorite channel right now is Katy Perry. I might be her oldest fan. I read...professional development books, even in the summer! I just went to Barnes and Noble and bought Strategies That Work, and a pack of new highlighters. What a geek! I do...make handcrafted jewelry, love using my silhouette cameo, and miss scrap-booking. I'm so far behind on my girls' scrapbooks that I don't know if I even could catch up! This could be because I try to do about fifty things at once and never quite get around to actually printing off the photos from my laptop. Link up at The Teaching Tribune to meet lots of other bloggers and teachers today, and check back through the week for more fun linkies! I have a silhouette cameo too and love it! How did I ever give gifts or have a classroom without this thing?! Hey, Melissa! I am still trying to figure out my cameo - I waste half the vinyl, or whatever I'm cutting, on boo-boos! I know, crazy, right? But I can't start watching reality TV now...I've invested so much time in avoiding it! HAHA! I rarely watch reality TV. I guess it's like life...I prefer it scripted. LOL! So very nice to "meet" you! First of all, I LOVE your blog design...absolutely precious! Secondly, no reality TV? I am addicted to the mind-numbing, pointless shows! Ha! Ha! I'm a 2nd grade teacher from Minnesota. I look forward to reading more on your blog. I am your newest follower! Thanks for your compliments and for following! I know - reality TV - I just don't get it! 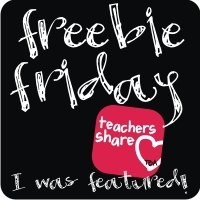 Can't wait to check out your blog and learn second grade stuff from you! Oh, my! I love it - I feel like you're the sister I never had! Thanks for following. Do you have a blog? I'd love to follow to learn from a more experienced mom and second grade teacher! I don't enjoy reality tv either. I have a cameo and need to learn how to use it. Any tips or go to sites? Oh, man! I wish I did have some tips or go-to sites for the cameo! I'm a newbie, too and mess up about half of everything I try to make! Let me know if you find a great site! I know, no reality TV. Maybe my life is real enough for one girl! I can't wait to check out your blog - thanks for following! Moving On and a FREEBIE!